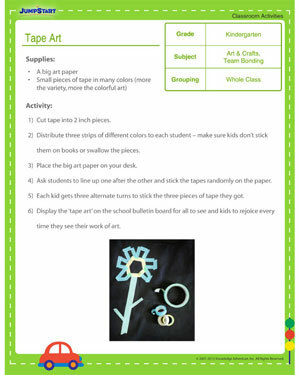 ‘Tape Art’ is a great classroom activity for kindergarten toddlers. Allow them to berserk with the tapes and stick them wherever they feel it will look great and bright. Kids will have endless fun with the classroom activity as they will get a rare chance to follow their whims. Their dreams will come true when they see their prized creation on the school bulletin board for all to see! Do this activity with kindergarten kids and have fun!